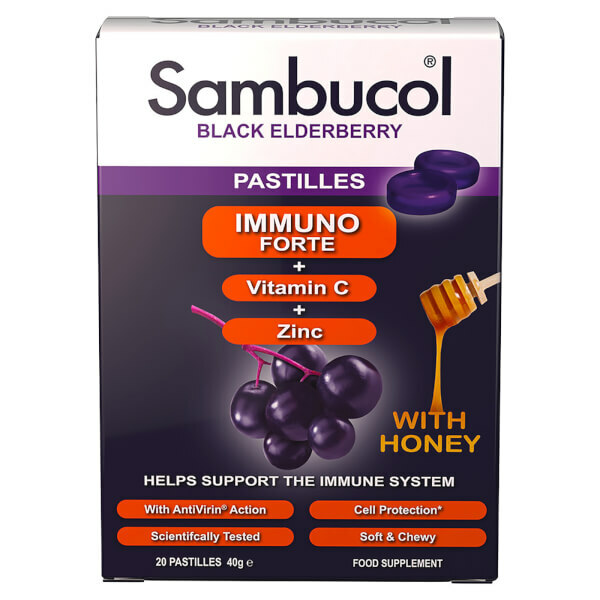 Stay healthy all year round with Sambucol Immuno Forte Pastilles; chewable, berry-flavoured supplements containing Vitamin C and antioxidant-rich Black Elderberries. Scientifically tested, the non-drowsy, great-tasting lozenges are free from added sugar and deliver AntiVirin® action (a proprietary term believed to help inhibit the spread of the flu virus). 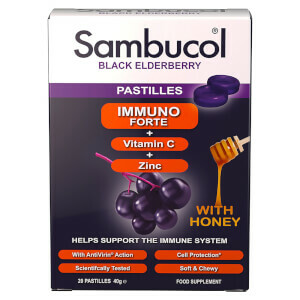 Easy and enjoyable to consume, the antioxidant-rich pastilles support the immune system to defend the body and help fight infections. Added Zinc and Honey deliver additional support when you start feeling under the weather. Suitable from 6 years+. Vegan and vegetarian. Alcohol and gluten free. No artificial colours. No added sugar.